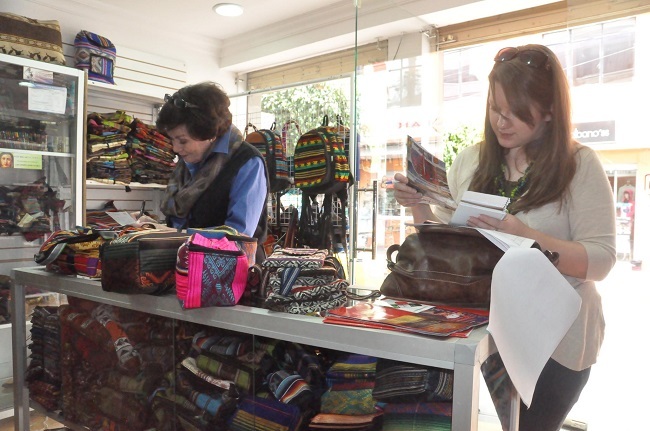 The SIFAT Village Store is dedicated to the support of microenterprises started by the indigenous people with whom we work throughout the world. SIFAT will use the profits from your purchase to continue sharing God’s love in practical ways. Often, multiple generations and languages are part of the shopping experience. Peggy and Marie refer to this shop as “Abuela’s Store” because of its owner. The grandmother (Abuela) and her husband have become our friends, though we sometimes rely on her children and grandchildren to translate as we not only need Spanish and English to complete orders, but also Kichwa, a native language. If you would like to visit The SIFAT Village Store in person, please call the SIFAT office at 256.396.2015 to make an appointment with Marie or Peggy. If you have questions or need more information about a product, please email villagestore@sifat.org. The Saturday market in Otavalo, Ecuador, is the largest in the world. It covers not only a large plaza, but extends into side streets to cover several blocks.